Prokopis Pavlopoulos was born in Kalamata to high school principal and classics teacher Vasilios Pavlopoulos and grew up in the same city. After finishing school in his home town, he entered the Law School of the University of Athens in 1968. In 1975, on a government scholarship, he received his DEA from the Paris Panthéon-Assas University, followed by his PhD in 1977 on Public Law. He then returned to Greece to serve his military service in the Hellenic Army (1978–79). He was elected Lecturer at the University of Athens in 1980, and he was promoted to Reader in 1981. In 1983 he became Assistant Professor and he was promoted to Associate Professor in 1986. In 1989, he was elected (Full) Professor of Administrative Law. In 1986, Pavlopoulos was an adjunct faculty member at the Panthéon-Assas University. Pavlopoulos was secretary to the first President of the metapolitefsi, Michail Stasinopoulos, in 1974. From November 1989 to April 1990, he served as alternate Minister for the Presidency and government spokesman in the ecumenical government headed by Xenophon Zolotas. He served as head of the legal office to President Konstantinos Karamanlis from 1990 to 1995, and political advisor to Miltiadis Evert, then chairman of New Democracy, from September 1995. He was elected as a State MP for the New Democracy party in the 1996 parliamentary election, and in the 2000 parliamentary election he was elected as an MP for the Athens A constituency. He was appointed as New Democracy's Press and Information Spokesman by Evert on 20 April 1996; he subsequently became its Parliamentary Spokesman on 14 April 2000. Pavlopoulos was successively re-elected for Athens A in the 2000, 2004, 2007, 2009 and 2012 elections. Following the March 2004 legislative election, which was won by New Democracy, Pavlopoulos became Minister for the Interior, Public Administration and Decentralisation in the new government of the Prime Minister Kostas Karamanlis on 10 March 2004. In the government appointed following New Democracy's victory in the September 2007 parliamentary election, the Interior Ministry was merged with the Ministry of Public Order, and Pavlopoulous became Minister of the Interior and Public Order. He is a member of the Central Committee of New Democracy, and on 29 July 2004 he was designated as a member of the party's Political Council as one of seven MP candidates; no vote was necessary because there were only seven MP seats available on the Council. On 17 February, Prime Minister Alexis Tsipras nominated Pavlopoulos as the ruling SYRIZA–ANEL coalition's candidate for the post of President of Greece in the presidential election that had begun in December 2014. 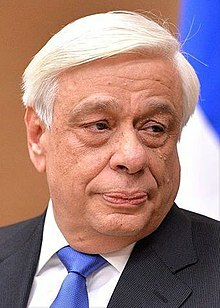 On 18 February 2015, backed by SYRIZA, ANEL and his own New Democracy party, Pavlopoulos was elected by the Greek Parliament as the new President of Greece with 233 votes in favour. He succeeded Karolos Papoulias after the end of the latter's term on 13 March 2015. Pavlopoulos is married to Vlassia Pavlopoulou-Peltsemi and together they have two daughters, Maria and Zoe, and one son, Vasilis. David Davis, son of the Katherine, Crown Princess of Yugoslavia (and her son Alexander Davis), are Godchildren of President Prokopis Pavlopoulos. ^ a b c d e f g Ποιος είναι ο Προκόπης Παυλόπουλος, ο υποψήφιος Πρόεδρος της Δημοκρατίας (in Greek). in.gr. 17 February 2015. Retrieved 17 February 2015. ^ a b c d e CV at the website of the Greek embassy in France Archived 2007-10-22 at the Wayback Machine (in French). ^ "New Democracy elects party secretary, Political Council; PM addresses Central Committee", Athens News Agency, July 30, 2004. ^ Τον Προκόπη Παυλόπουλο πρότεινε η κυβέρνηση για Πρόεδρο (in Greek). in.gr. 17 February 2015. Retrieved 17 February 2015. ^ Πρόεδρος της Δημοκρατίας με 233 ψήφους ο Προκόπης Παυλόπουλος (in Greek). in.gr. 18 February 2015. Retrieved 18 February 2015. ^ "Prokopis Pavlopoulos: Who Is the New President of the Hellenic Republic?". Greek Reporter. February 18, 2015. Retrieved April 21, 2015. ^ "CIDADÃOS ESTRANGEIROS AGRACIADOS COM ORDENS PORTUGUESAS - Página Oficial das Ordens Honoríficas Portuguesas". www.ordens.presidencia.pt (in Portuguese). Retrieved 2018-03-07.